There isn't any troll in the title. The "World's Largest microSD" card sized at 200GB is now officially available for purchasing from Amazon and number of retailers. Order a Sandisk's new high-capacity microSD card from Amazon now. However, the only issue is that it is not exactly very cheap. You will have to pay around $240 to buy one. Back in March when Sandisk first announced the world's first 200GB microSD card, it was expected to be priced at around $400. However, $240 has been marked as the price for the highest-capacity microSD card available in the market. 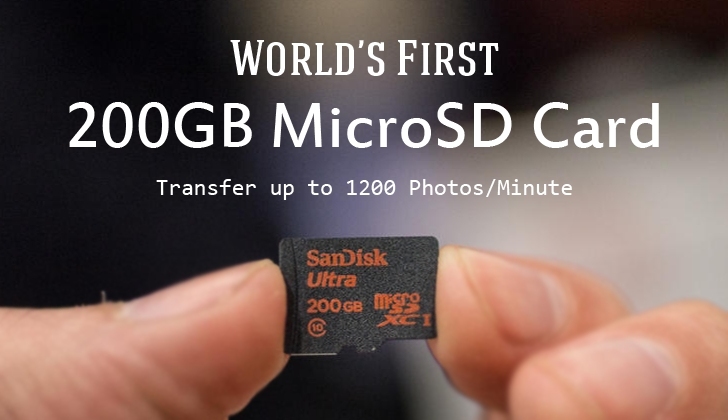 Sandisk's 200GB microSD card, or Ultra microSDXC UHS-I card, offers a transfer speed of up to 90MB per second, which is double the speed provided by its 128GB counterpart. Moreover, Sandisk's 200GB MicroSD card comes packaged with an SD adapter and a 10-year limited warranty.